Lysozyme is an antibacterial found in abundance in the human body – in tears and saliva; and is also present in the spleen, lung, kidney, white blood cells, plasma, and breast milk. Lysozyme has antibacterial activity against a number of bacterial species. Just as lysozyme is an antibacterial in humans, lysozyme from hens’ egg albumen has been used in cheese making to prevent a production defect called butyric late blowing due to the Clostridium bacteria. An example of a cheese with the Butryic Late Blowing defect. Research for using Lysozyme from hens’ egg albumen began in the late 1960s and 1970s. This research was followed by trials on cheese carried out in Europe in the early 1980s. These trials demonstrated the efficacy of lysoyzyme to prevent the late blowing defect in different types of cheese. Since then, hens’ egg albumen lysozyme has been recognized as by the FDA as “The most ‘generally recognized as safe'” effective organic anti-bacterial for use in food (Rulis). Because lysozyome in cheese is from egg, some cheese ingredients list may mention that the product contains egg by FDA allergen regulations. Many species of the genus Clostridium, also known as butyric acid bacteria or BAB for short, are endospore-forming obligately anaerobic bacteria able to ferment carbohydrates. 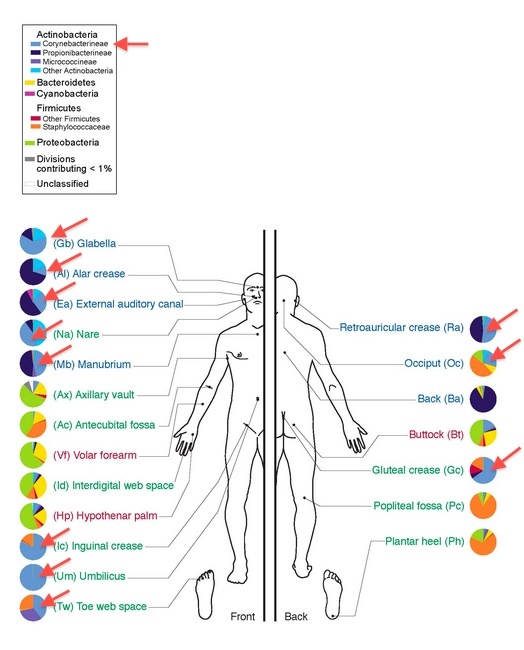 Clostridia species have been identified as a significant milk contaminant by having been frequently detected in cheese samples that show the presence of Butyric late blowing. Clostridium tyrobutyricum, Clostridium butyricum, and Clostridium sporogenes are the most commonly observed species. Together, these species are called “butyric acid spores.” Among the three species, C. tyrobutyricum has been the most extensively studied. It is acid-tolerant, characterized by the ability to ferment lactate (lactic acid sans a hydrogen) to butyric acid, carbon dioxide, and hydrogen. It is these carbon dioxide and hydrogen gasses that cause larger than normal eyes in the cheese and large cracks and bursts within the paste. Silage, a forage conservation technique, is frequently pointed as the principal source of butyric acid spores of ruminant feed. Silage is harvested crops, mainly grass and corn, and stored in silos to ferment. Compared to hay, silage can provide a richer source of available provitamins A and other carotenoids and tocopherols. Because silage is full of vitamins and important nutrients that grazing animals need, silage has markedly exceeded hay production in many countries and has been the prevailing type of preserved forage. Some farming systems are based on year-round silage feeding to cattle. However, Silage can also be a pool of the undesirable bacteria. Bacteria such as Bacillus cereus, Clostridium tyrobutyricum and Listeria monocytogenes can carry over some components affecting sensory properties from silage to cow’s milk creating a concern to those in the dairy industry. The crops that are harvested for silage are placed in a silo and within 48 hours the stack will start and finish an aerobic fermentation phase in which trapped oxygen is consumed and is then followed by anaerobic fermentation that will convert sugars to acids. Complete fermentation takes approximately two weeks. In the past the fermentation was conducted by indigenous microorganisms, but today the chemical reactions that occur in the stack are regulated. Some bulk silage is inoculated with specific microorganisms to speed fermentation or improve the resulting silage. Silage inoculants contain one or more strains of lactic acid bacteria, and the most common is Lactobacillus plantarum. 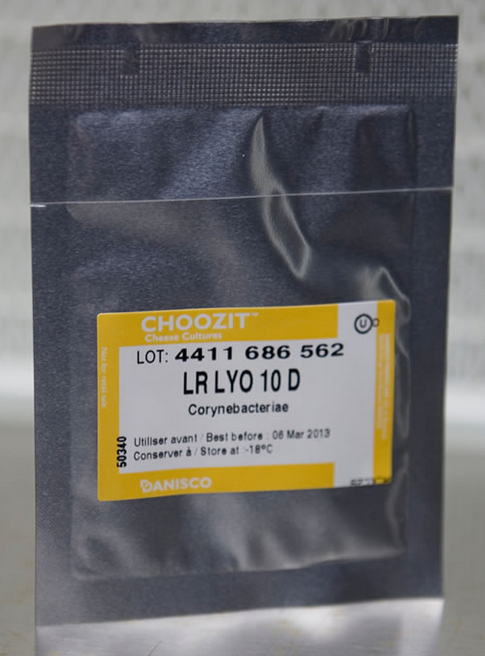 Other bacteria used in inoculants include Lactobacillus buchneri, Enterococcus faecium andPediococcus species. Clostridia are bacteria found in the soil and on dirty plant material. 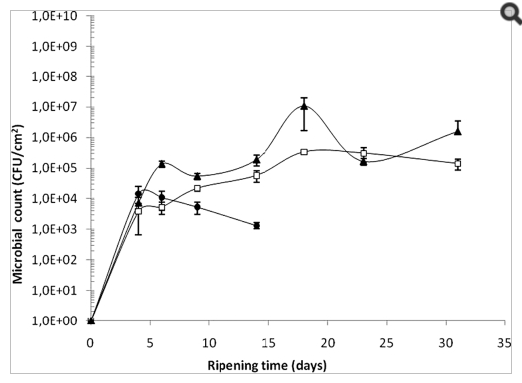 Pollution by earth and dead plant elements further increase the risk of butyric fermentation by increasing the introduction of Clostridia into the silaged crop. Clostridia in silage impair milk quality due to the fact that clostridial spores can survive the passage through the alimentary tract of a dairy cow. Clostridial spores present in silage are transferred to milk via faeces and faecal contamination of the udder. How does Lysozyme Work as an Anti- Chlostridium Bacterial? Lysozyme is such a strong component of the immune system because it is able to degrade peptidoglycan present in bacterial cell walls. It destroys the Chlostridium cell wall by cleaving the Beta (1-4) N-acetyl-D-glucosamine polymer located in the peptidoglycan cell wall of the bacteria. Some Clostridia can cause serious health problems. One extremely toxic species is Clostridium botulinum. We now know that butyric acid, which makes cheese unpalatable, and an accumulation of carbon dioxide and hydrogen gas, that cause defects in the cheese, both result when Chlostridia ferments sugars or lactic acid during ensilage. Hen egg albumen lysozome has been approved by the FDA as an anti-bacterial to destroy the cell walls of any present Chlostridia to prevent these unfavorable results in the cheese making process. During cheese making, lysozyme is added to cheese vats in either a liquid or spray dried and granulated form. At the pH of the milk, lysozyme is positively charged, and as the curd forms, lysozyme is electrostatically attracted and adsorbed to the negatively charged casein molecules that form the curd. After separation of the curd from the whey, greater than 90% of the lysozyme activity resides with the curd. From a consumer’s point of view, lysozyme is completely harmless unless consumers are allergic to hen’s egg whites, in which case they may be allergic to lysozyme. Some cheese companies are working hard to make sure lysozyme is included in the list of ingredients. If you have this allergy, please read the label. Clostridia – the underestimated danger in dairy farms. Addcon Green Chemistry. Categories: Chemistry | Tags: Alexander Fleming, anti-bacterial, Butyric, enzyme, late blowing, Lysozyme, protein, Silage | Permalink. I was looking up information about probiotic diets one afternoon when I came upon the Wikipedia page for Skin Flora and an image on the page caught my eye. It was an image of a man and the types of bacteria that grow on skin on different parts of the body. One of the types of bacteria was familiar — it was the same type we put in the milk to make our washed rind, Tobasi! 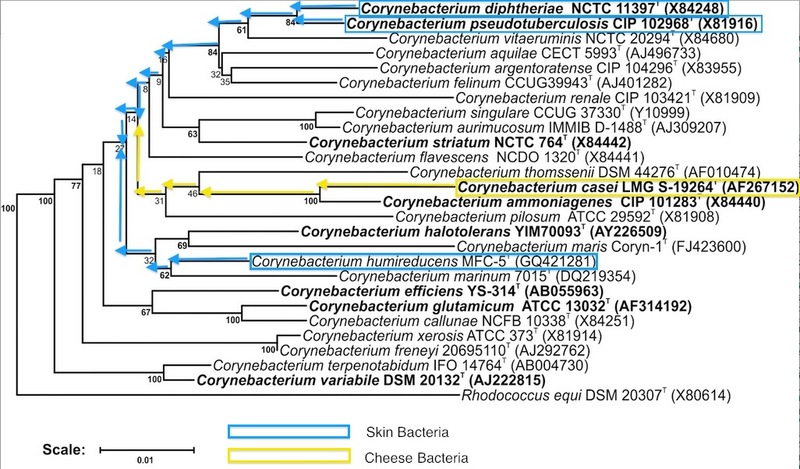 Corynebacteriae. It’s in the crevice of your nose, in your groin (inguinal crease), your belly button (umbilicus), and your “toe web space.” It’s also what contributes to the beige-red color (Law, Tamime) of the rind of washed rind or smear-ripened cheeses. While in utero, a human fetus is sterile. It is not until the mother’s water breaks and the baby is being pushed through the birth canal that bacteria is introduced to the baby’s skin. Later, handling and feeding the newborn will contribute to the bacterial population and while we’ve established most of our bacteria in the first 48 hours of our life, our environment will continue to shape us. Due to lactic acid in sweat and produced by skin bacteria, superficial layers of the skin are naturally acidic (pH 4-4.5) . 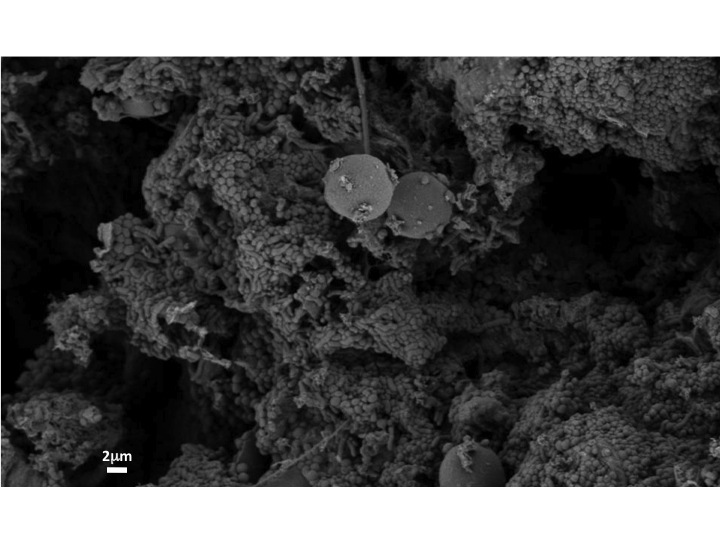 At this pH mutualistic flora such as Staphylococci, Micrococci, Corynebacterium and Propionibacteria grow (Lambers et al.) (Some of you turophiles may find that last one familiar as well). This is about the same pH that we want our Tobasi, our washed-rind cheese, to be when it is ready to be put in the aging room to begin rind development so the rind is hospitable to grow the desired bacteria. But no, they are not the same bacteria. Same genus, different species. When selling cheese people inevitably ask me what the rind is made of and if can they eat it – a valid question and one that I delight in answering. Upon hearing the answer many people cannot keep from wrinkling up their nose when they hear that the rind is bacteria (or mold). But it’s all over you too, microbeface! It seems that you truly are what you eat! Categories: Cheese Production, Chemistry, Cricket Creek Farm | Tags: bacteria, microbes, skin | Permalink. The essential characteristic step in the manufacture of all cheese varieties is coagulation of the casein component of the milk protein. Coagulation may be achieved by a variety of means, but the majority of cheeses are produced by enzymatic (rennet) coagulation. There is indicating evidence that the Jews were the first to develop the practice of coagulating milk with a thistle bloom. Cheeses prepared with animal enzymes were prohibited under the strict Jewish dietary laws, which forbade religious Jews to cook any animal’s meat in its mother’s milk or other- wise to mix meat with dairy products. The stamen of the cardoon plant contain a milk-clotting activity that has been extracted through traditional cheese-making techniques in Portugal and Spain for centuries. Aqueous extracts show proteolytic, lipolytic and amylolytic activities; which means that there are activities that break down proteins, lipids, and converting starch into sugar. The extracts also contain aspartic proteases which are a family of protease enzymes that use an aspartate residue (which can be a carboxylate anion, salt, or ester of an alpha amino acid, aspartic acid) to catalyze peptide substrates. Scientists have only gained a better understanding of plant aspartic proteases until relatively recently. In 1997, the NC-IUBMB (Nomenclature Committee of the International Union of Biochemistry and Molecular Biology) adopted the name phytepsin – which was introduced to denote all related plant aspartic proteases. While not all phytepsins have been fully investigated, phytepsins from cardoon Cynara cardunculus have been especially well characterized. Three phytepsins were purified from cardoon flowers and partially characterized and identified as cynarases 1-3. Later, the primary structure of cyprosin was determined and these phytepsins were later renamed cyprosins 1, 2, and 3. 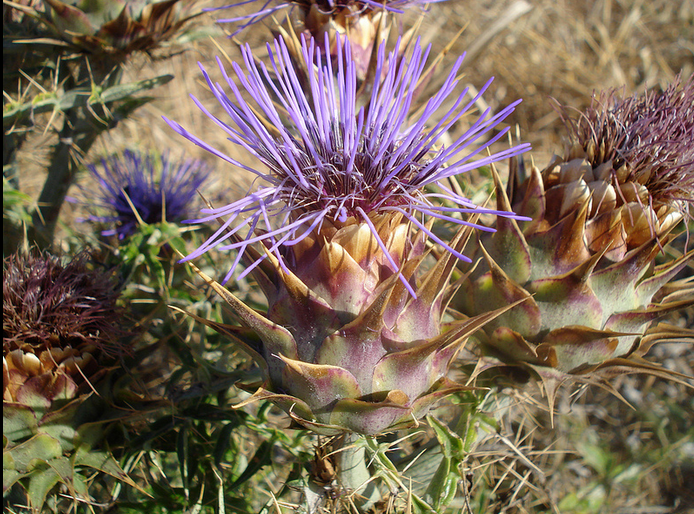 Two other phytepsins named cardosin A and cardosin B (cardo is the Portuguese name of the plant), have subsequently been extensively studied from cardoon flowers. In contrast to the animal rennet enzyme chymosin, which is specific for cleaving only kappa-casein, the aspartic proteases present in plant extracts are very active nonspecific protein cutters. These aspartic proteases cleave alpha, beta, and kappa caseins. However, this causes excessive acidity, bitterness, and potential texture defects in the cheese, thereby limiting their use. But it is these characteristics that are responsible for the special flavor, smell, and consistency of the cheese varieties produced using plant enzymes. Many cheeses from the Spanish and Portuguese regions that use vegetable rennet are made with sheep’s milk. Cow’s milk poses problems for use with cardoon coagulants. The enthusiastic cutting activity of the cynarase creates five bitter peptides from cow’s milk proteins that are not formed from the proteins in ewe’s milk. Serendipitously, the rugged Iberian terrain is ill suited to the needs of delicate dairy cattle, but agile browsers like sheep and goats thrive there. Categories: Chemistry, Rennet | Tags: cardoon thistle, rennet, thistle, vegetable rennet | Permalink. Why does buffalo Mozzarella melt but not brown when it’s baked? 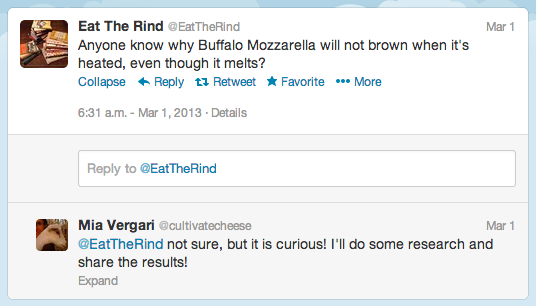 This question was posed to the twittersphere by Eat The Rind. Curious, I decided to take on the challenge of answering this question. There are two main types of mechanism by which browning of food occurs, depending on whether or not the process is mediated by enzymes. If enzymes have been inactivated during heat processing, only nonenzymic browning can occur. The Maillard reaction is one of three non-enzymatic browning reactions. This reaction is a heat-induced reaction that occurs between a carbonyl compound, which is usually a reducing sugar, and an amine, usually an amino acid, a peptide, or a protein. If cheese contains a high level of residual galactose (or lactose or glucose) due to the use of a starter unable to utilize galactose, it is susceptible to Maillard browning. The intensity of browning depends on the sugar content of the cheese and the ability of the cheese proteins to remain hydrated during cooking. I. Initial stage: products colourless, without absorption in the ultraviolet (about 280 nm). III. Final Stage: Products highly coloured. Reaction G: Aldehyde-amine condensation and formation of heterocyclic nitrogen compounds. Since it has been noted that a positive correlation between galactose content and brown color intensity in heated Mozzarella cheese exists, starter cultures containing lactic acid bacteria strains able to equally convert glucose and galactose to lactic acid are needed if browning is to be avoided. According to A.H. Jana, the only starter used for fresh Italian Mozzarella is Streptococcus thermophilus. Streptococcus spp. and Lactobacillus helveticus are used in Mozzarella because they release inappreciable amounts of galactose into the cheese curd by fermenting accumulated galactose through metabolism. Manufacture of high-moisture Mozzarella entails use of starters like S. lactis, S. durans or S. faecalis, wheras for low-moisture Mozzarella the starters recommended are S. thermophilus, L. bulgaricus and/or L. helveticus. It has been reported that use of culture composed of one or more of the species of P. cerevisiae, L. plantarum, L. casei, S. faecalisand S. durans in addition to the standard starter culture yielded cheese containing less than 0.3% lactose, also helping in avoiding burning or blistering during baking on pizzas. Mozzarella cheese having reduced lactose content is a key factor in order to avoid burning or blistering of cheese during baking. The melting properties of Mozzarella are based on the number and strength of casein-casein interactions (bonds between casein proteins). When cheese is first placed into an oven, the cheese temperature quickly rises, but the shape does not change. As the cheese reaches a critical temperature called the softening point, it begins to flow. At this point, the cheese not only continues to rise in temperature, it also changes shape. The cheese’s casein protein matrix begins to collapse, fusing into a semi-solid mass. Technically, caseins do not melt, but interactions with each other result in an outcome referred to as melt. As cheese is heated, there is a more rapid relaxation of protein-protein bonds and a greater thermal motion of casein strands, which results in cheese becoming more liquid-like. Next, the melt profile reaches a third critical point called the complete melt point. After this point, cheese height changes are minimal, and cheese temperatures slowly approach the oven temperature. A relatively low number of fat globules in reduced-fat cheese results in a denser structural matrix leading to a firm and dry cheese that melts poorly. As fat content decreases, changes in physical properties and flavor lower the cheese quality. The change in physical and functional properties are presumably due to loss of plasticizing action of the fat and increased cross-linking within the curd and hence in the cheese. 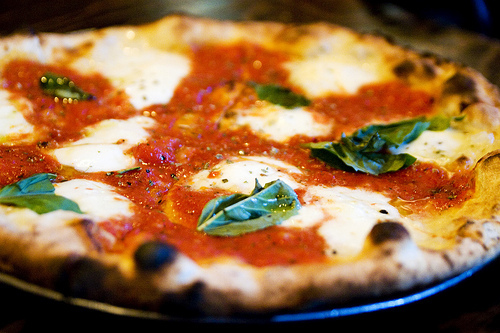 Covering the skim or low-fat cheese surface of a pizza with a hydrophobic barrier (such as olive oil) will affect the melting and browning behavior of Mozzarella cheese. The barrier will prevent moisture loss that will limit melting. Therefore, fat within the interior microstructure of the cheese was not necessary to achieve the proper functionality of fat-free and lower fat Mozzarella cheeses during pizza baking. Buffalo Mozzarella uses a starter that metabolizes sugars that cause browning and even though buffalo milk has a high percentage of proteins, it also has a high percentage of fat causing a less dense protein matrix that is easy to melt. Categories: Chemistry, cooking | Tags: buffalo, buffalo milk, cooking, mozzarella | Permalink. “Flowery,” “Steamed Broccoli,” “Dank Basement,” – Where do Cheese Flavors Come From? Alternative title: Fat is Flavor! 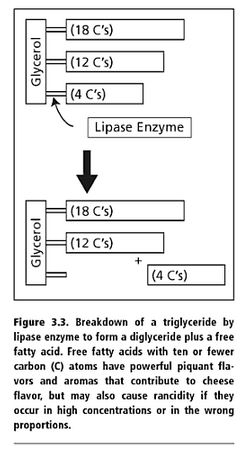 One of the key flavor formation pathways is the enzematic hydrolysis (lipolysis) of triglycerides. Okay, let’s break that statement down into it’s basic parts: A triglyceride is a molecule that is composed of a glycerol with three fatty acids. Enzematic hydrolysis, or lipolysis, is the breakdown of lipids – of which, triglyceride is one – that cleaves the bonds between the glycerol and its fatty acids. Since this is enzematic hydrolysis, the enzymes lipase and esterase are catalysts that help speed up this reaction. So, through the speedy separation of glycerol and fatty acids aided by lipase and esterase, the fatty acids are removed from the triglyceride and it is these fatty acids that cause the various flavors we perceive in cheese. Once these fatty acids are removed from the glycerol, they are called free fatty acids. Lipolysis = Triglycerides (glycerol + 3 fatty acids) + lipase/esterase enzyme = free fatty acids = TASTY GOODNESS!! Cool! But there are so many flavors in cheese – how do free fatty acids create them all? A fatty acid is made up of a carboxyl group and, more importantly for our purposes, a hydrocarbon ‘tail’. Free fatty acids found in cheese have short-chain hydrocarbon tails that consist mainly of 4, 6, 8, or 10 carbons. Short-chain fatty acids provide desireable piquant flavor and aroma in many cheeses. The fat in sheep’s milk and goat’s milk contains higher concentrations of short-chain fatty acids than that in cow’s milk. Because of this, some sheep and goat cheeses attain a more peppery, piquant flavor and aroma profile than their cow’s-milk counterparts. Further reactions of the fatty acids (such as oxidation) cause various specific flavors produced by different fatty acid flavor derivatives: ethyl esters (fruity aromatic notes, floral, goaty), thioesters (cheesy, cooked vegetable), branched chain keto acids (pungent cheesy), and unsaturated alcohols and ketones (mushroom-like). N-Methyl ketones, prduced by partial beta-oxidation of fatty acids, are of particular importance to blue cheese flavor. Port Salut and Monterey Jack are two semisoft cheeses with similar flavor characteristics – they are mild and milky although the Monterey Jack cheese had a slightly more sharp, diacetyl-like flavor. Interesting to note is that their flavor characteristics are similar and their free fatty acid profiles were also similar. And, of the cheese varieties analyzed, these two cheeses were among the lowest concentrations of free fatty acids. Limburger cheese, known for it’s strong taste and stronger smell, contained some of the largest amounts of 4 and 6 chain carbon free fatty acids among the soft and semisoft cheeses. Gruyere also contained relatively high concentrations of 4 and 6 chain free fatty acids. Gjetost and goat’s milk cheeses both contained goat’s milk fat, but the caramelized Gjetost exhibited only a mild goaty flavor. 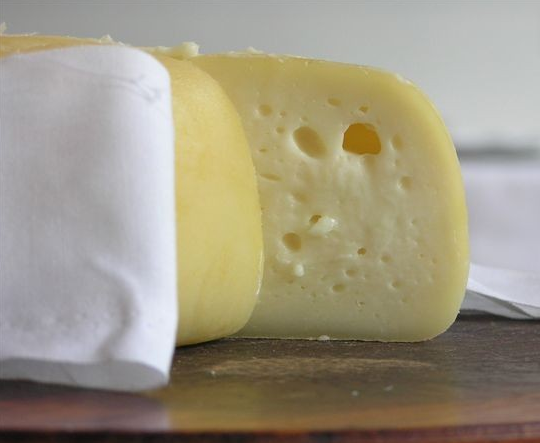 The Gjetost probably contained some cow’s milk, whereas the goat’s milk cheese was manufactured with only goat’s milk, which accounted for its higher concentrations of 8 and 10 chain free fatty acids and stronger goaty flavor. Why is the Camembert originating from Germany? I don’t know. Look at how many more 4, 14, and 16 carbon chain free fatty acids brie has compared to camembert! On the other hand, the French Roquefort and the U.S. blue are awfully similar in the total amount of free fatty acids. Of course, terroir and breed of animal affects the flavor as well, perhaps introducing a different concentration of free fatty acids into the cheese, but that is a topic for next time. Unfortunately, I cannot give a summary of her talk because it was a presentation of data on a project that is not yet complete. However, she was able to send me some really amazing photos of microbes on cheese. What I can share is the work that Rachel Dutton has done up to now. Rachel’s lab is located at Harvard University, in the FAS Center for Systems Biology. The goal of her research is to identify the mechanisms and principles through which microbial communities function. Coming to an understanding of the formation, function, and evolution of microbial ecosystems is seen as one of the most important challenges facing microbiology. Rachel Dutton is attracted to cheese because of the simplified, experimentally tractable microbial ecosystems found growing on the surface and cheeses are ideal models to study the behavior of microbes in complex communities. These communities, and their rich assembly of metabolic capacities, contribute much of the diversity in flavors, smells, and textures of the hundreds of different varieties of cheeses. Camembert is covered entirely of microscopic organisms that contribute to the creation and consistancy of the paste, the unique flavors, and the familiar bloomy white rind. The technical term for this community of organisms is ‘biofilm’ – a web of interconnected microbes that rely on each other to create their own environment. Interestingly, biofilms are not just a large swath of microbes, but organized masses of organisms that have been proven to have communication capabilities. In a process called quorum sensing, individual cells constantly send out and measure chemical signals. Through these chemical signals, if a bacterium or fungus can recognize enough of its own kind (or enough other species) in the area, the cells switch from acting as individuals to acting as part of a community of connected organisms. With the addition of strands of protein and sugars, the microbes weave themselves with these other molecules to become much tougher. This toughness proves beneficial for cheesemakers in that the biofilm resists the growth of undesirable bacteria and mold, while regulating the flow of gas and moisture into and out of the cheese. 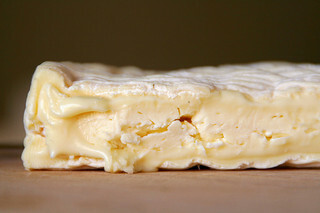 Industrial cheesemaking techniques ensure that cheeses are inoculated with just one or two key species, so a commercial Brie might be dominated by only a single strain of Penicillium camemberti. While this method does keep cheese production consistent, it doesn’t provide complex, interesting flavors as found on many artisinal cheeses. Cheesemakers carefully control each element in a cheese’s creation so that the right milk is colonized by the right bacteria and fungi at the right time. Cheese aging caves are kept at specific temperatures and humidities to cultivate desired species of fungi. Any slight adjustment in these numbers could cause an explosive bloom of an unwanted microbes. found an “exceptionally cosmopolitan” community of microorganisms living there. 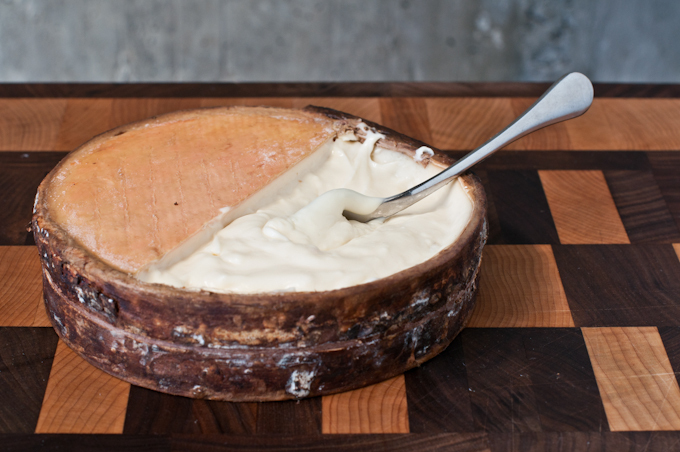 The rind of Jasper Hill’s Winnimere is washed in beer brewed from microbes living in the cheese’s aging cave. It was not unexpected that many salt-loving (halophilic) bacteria were discovered on the rind, but what did come as a surprise was the range of other unfamiliar bugs that are also found in places like Etruscan tombs, Tunisian oil wells, or Arctic sea ice. Culture magazine commented that the discovery of these microbes on cheese is a far cry from the “big three” that dairy scientists generally focus on: the Lactococcus bacterial strains that produce the cheese paste, the Penicillium fungi that produce blue and bloomy rinds, and the Brevibacterium that supply the pungent pieds-de-Dieu aroma of washed rinds. While the exact role of each of the oddball microbes found in Winnimere isn’t known, it is understood that without this specific mix living on the rind, Winnimere wouldn’t have its unique flavor. The Dutton lab is working hard to figure out the purpose of each microbe, and their interaction within the larger cheese rind community. In the bigger picture, beyond developing cheese textures and flavors, Dr. Dutton sees cheese as a model for how all kinds of microbial systems work. Helping researchers better understand microbial communities could mean that cheese could act as a proxy for the biofilm of an oil-slicked wetland or the distressed lung of a cystic fibrosis sufferer. A majority of this post is a summarization of the article Microbe Managing – The Lifesaving Potential of Cheese Bacteria written by Will Fertman for Culture magazine. Categories: Cheese Scientist Profile, Chemistry | Tags: aging, bacteria, fungus, mold, ripening | Permalink. The ripening process of cheese is very complex and involves microbiological and biochemical changes to the curd resulting in the ﬂavor and texture characteristic of the particular variety. Although a considerable variety of molds and fungi has been observed on Camembert cheeses, a list of possibly twenty species would include those which were often found. Among these are perhaps six species of Penicillium, two or three of Aspergillus, Geotrichum candidum (previously known as Oidium lactis), Cladosporium herbarum, one or two of Mucor, one or more of Fusarium, Monilia candida, and two species perhaps related to it, with the incidental occurrence of Acrostalagmus cinnabarinus, a Cephalosporium, various species of Alternaria, and Stysanus. Besides these, yeasts such as Kluyveromyces lactis were found in large numbers and considerable variety in many cases. We are just going to focus mainly on P. camemberti and G. candidum whose mycelium development is responsible for the bloomy aspect of Camembert-type cheese. The comparison of the results by a 1906 study done by Charles Thom, mycologist in Cheese Investigations in the Dairy Division of the Bureau of Animal Industry, showed that a single species of Penicillium was present upon every Camembert cheese that was examined and in partially ripened cheeses this mold often covered the majority of the cheese surface. This mold is known as “Penicillium Camemberti” or the “Camembert mold.” This species develops a large and characteristic growth of aerial mycelium in addition to a densely felted mass of white threads which penetrate the surface of the cheese for 1 or 2 mm. and largely constitute the rind. Microbial count on acidified potato dextrose agar medium (pH 3.5) of the K. lactis LMA-437 (●), G. candidum LMA-436 (□), and P. camemberti (▲) ripening culture. Salts are ionic compounds that result from the neutralization reaction of an acid and a base. Both lactate, from lactic acid, and Calcium (Ca) and Phosphate (PO4) are defined in chemistry as salts. P. camemberti and G. candidum oxidatively metabolise lactate to CO2 and water, deacidifying the cheese surface and resulting in a higher pH at the rind of the cheese. This deacidiﬁcation causes a pH gradient to develop from the center of the cheese to its surface and this established pH gradient of decreasing values towards the center of the cheese causes lactate to migrate towards the surface where it is used as a carbon source by P. camemberti. As the cheese continues to age and the microbes continue to metabolize, pH increases to about 7.0 in the outer part of the cheese and about 5.5 in the centre. 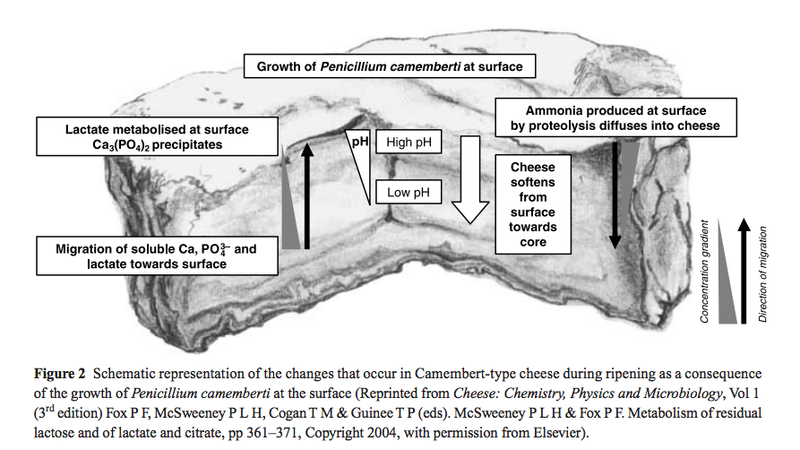 The change of pH is most pronounced on the surface of the cheese, which is covered by the white mycelium of the P. camemberti after a week of maturation. When lactate becomes depleted, casein, a milk protein, is then metabolised. Calcium phosphate, found in high quantities in or on the casein micelles, is also soluble in acid environments, and as the pH of the surface of the cheese decreases, calcium phosphate migrates towards the surface of the cheese, where it then precipitates as a layer of Ca3 (PO4)2. This migration results in a calcium phosphate gradient from centre to surface and the depletion of calcium phosphate in the center of the cheese assists in the development of the desired soft texture of the cheese. Reduction in the concentration of calcium phosphate, together with increased pH and proteolysis (the breakdown of proteins – casein proteins in this case) results in softening of the interior, which is characteristic of mature Camembert-type cheese. Further metabolisation of casein results in the formation of ammonia from amino acids. In very mature cheese, ammonia is produced at the surface from proteins and diffuses into the curd. A cheese that smells very strongly of ammonia is extremely old and probably should not be eaten. The proteinases (enzyme that conducts proteolysis) from P. camemberti migrate very slowly into the cheese, and only reach a depth of about 6mm from the surface. This means that their direct participation in the enzymatic reactions deep in the interior of the cheese is limited. The important enzymatic activities in the interior of the cheese are caused by the enzymes from the rennet, the plasmin from the milk and enzymes from the lactic acid starter cultures. 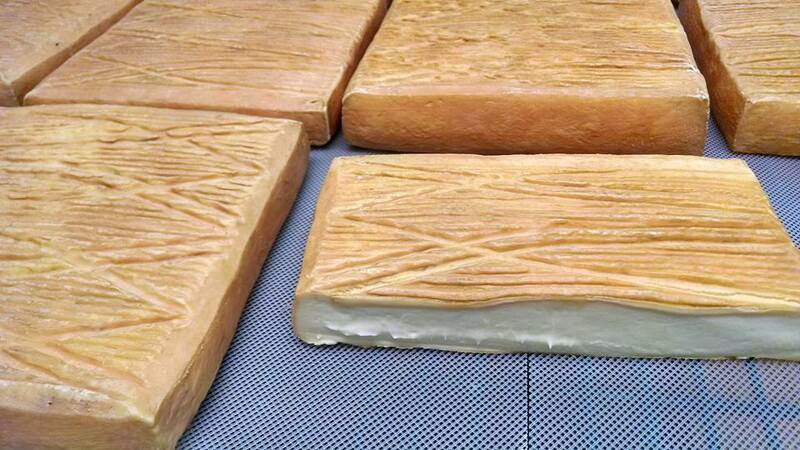 The French have been producing Camembert cheese for hundreds of years. The creamy consistency and delicious, earthy flavors (flavor chemistry is a post I hope to tackle soon) all result from ambient fungi. While it is true that some cheesemakers spray the necessary fungi on their cheeses in the aging caves, there are still many that allow the fungi to settle naturally to ripen the cheese. It is interesting to me – and I hope I have enlightened you as well – about what you’re eating and the relationship between you and the fungi on the cheeses you love. The research on cheese microflora continues today – there are many studies and unanswered questions. Boutrou R, Guéguen M. Interests in Geotrichum candidum for Cheese Technology Int J Food Microbiol. 2005 Jun 25;102(1):1-20. Categories: Chemistry, Uncategorized | Tags: aging, camembert, fungus, mold, ripening | Permalink.